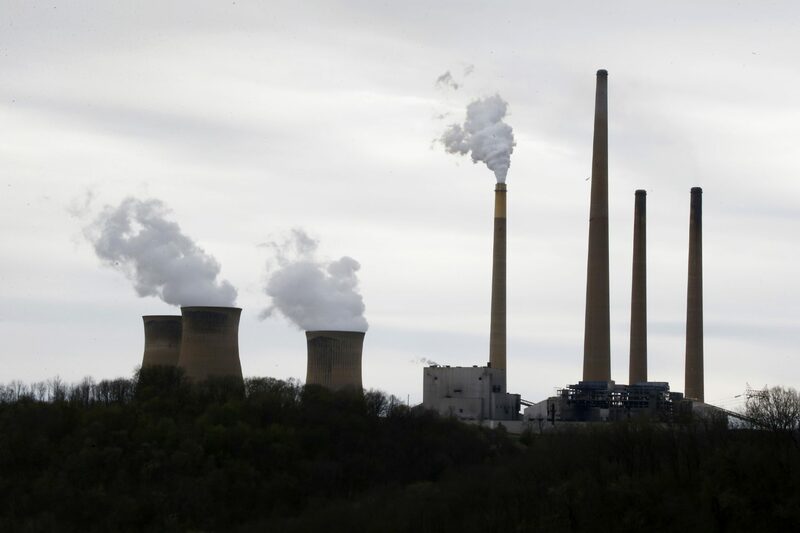 This photo taken May 5, 2014 shows the stacks of the Homer City Generating Station in Homer City, Pa. Three years ago, the operators of one of the nation’s dirtiest coal-fired power plants warned of “immediate and devastating” consequences from the Obama administration’s push to clean up pollution from coal. Faced with cutting sulfur dioxide pollution blowing into downwind states by 80 percent in less than a year, lawyers for EME Homer City Generation L.P. sued the Environmental Protection Agency to block the rule, saying it would cause a painful spike in electricity bills and grave harm to power producers like itself. Led by the Philadelphia-based Clean Air Council, 61 petitioners are calling on state regulators to establish an economy-wide cap-and-trade program in Pennsylvania, using California’s system as a model. Among states, Pennsylvania is the third biggest emitter of carbon. The petition sets in motion a legal process that entails a response from the state. Clean Air Council executive director Joe Minott pointed to two recent climate change reports—one from the United Nations in October and another from the U.S. government, released last week, outlining the dramatic changes already occurring and risks of failing to sharply reduce emissions. Cap-and-trade is a market-based system that sets a firm, overall limit on emissions. Companies are then allowed to buy and sell allowances to pollute certain amounts. California’s program applies to greenhouse gas emissions from the electricity sector, as well as to other major air pollution sources, the import of electricity, and the sale of natural gas, heating oil, and gasoline. In what’s called a petition for rulemaking to the state’s Environmental Quality Board, the groups argue the Department of Environmental Protection already has the authority set up such a system under Pennsylvania’s Air Pollution Control Act and Article 1 Section 27 of the state constitution—known as the Environmental Rights Amendment. The amendment was added in 1971 and guarantees citizens the right to clean air and pure water. It also requires the state to act as a trustee of the public natural resources for all the people, including “generations yet to come.” After being largely ignored for decades, the amendment has seen a resurgence following two recent state Supreme Court decisions. Robert McKinstry, a retired attorney working pro bono on the petition, co-authored a recent paper for The Michigan Journal of Environmental & Administrative Law with Widener University Professor John Dernbach. They argue the Environmental Rights Amendment creates a constitutional duty for Pennsylvania to act on climate change. Although a similar—ultimately unsuccessful— climate petition was filed several years ago, McKinstry said this effort is strengthened by the state Supreme Court’s landmark 2017 decision in Pennsylvania Environmental Defense Foundation v. Commonwealth, which upheld a broad interpretation of the amendment. McKinstry said the emissions cap would start with a budget, assuming a three percent reduction from 2016. The cap would be reduced by three percent a year, from the 2016 baseline. The report urges the world’s governments try to keep the warming below 1.5 Celsius (3.6 degrees Fahrenheit) above pre-industrial levels. Scientists say the world faces myriad crises as early as 2040—including food shortages, extreme weather, wildfires, and a mass die-off of coral reefs—unless greenhouse gas emissions are sharply cut. An analysis by the UN published Tuesday shows countries are falling far short of the emissions reductions pledges they made in Paris three years ago. Minott believes the law is on the petitioners’ side, but he acknowledged the politics are more complicated. “Pennsylvania is a fossil fuel state,” he said. Governor Tom Wolf, a Democrat, was recently re-elected. He has acknowledged the threat of climate change but did not make addressing it a top priority during his first term. If the petition were embraced by his administration, it could allow them implement significant climate regulation through the executive branch. In an email, Wolf spokesman J.J. Abbott said the governor believes climate change is real.